Christian House of Prayer is located in Killeen, TX, right next to Fort Hood. Many of our members are part of the military. We’ve been around for 35 years now, with the same lead pastor – Bishop Nate Holcomb – and we have around 2,200 attendees every Sunday. We also have about 300 ministries under us. My job is to travel as needed to help them with their production needs, as well as maintain the production needs of our main facilities. We currently have three main facilities in Texas; our Killeen Sanctuary where we hold the Sunday Morning and Wednesday Evening church services, the Sonship Lecture Hall where we hold biblical study classes streamed across the world, and the Coppers Cove Sanctuary where we hold conferences, weddings, funerals, banquets etc. I designed a system that would ­t all of our needs within our facility and came across Focusrite through Greg Narkiewicz at Sound Productions in Dallas. We wanted a system with great preamps and quality sound without losing the ­fidelity you sometimes come across when you go to digital. Our RedNet system feeds four main positions: front of house, monitors with 22 myMix systems and 12 in-ears, broadcast for all outside media, and lastly ProTools HD. We have the current capability to track 64-channels through two RedNet HD32R units. With the high-end microphones and cabling we’ve created a state-of-the-art live recording studio. 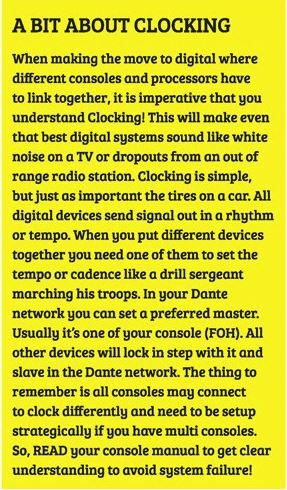 All positions receive audio fed through Dante protocol. We currently use thirteen RedNet units – eleven MP8Rs and two HD32Rs. All of our front end audio runs through the MP8Rs; meaning all audio inputs are implied with true audio clarity, that only RedNet can give, and delivered to all audio positions noted above. One of the great things about RedNet is that it’s very easy to learn as well as a cost-effective way to deliver audio. With RedNet, using Dante protocol, we can split to all the different positions without losing ­fidelity or sound integrity which can sometimes happen with the warmer tones when you are running digital versus analog systems. Our old system was a total of 72 lines at each position and we needed to increase the channel count to its now current state; 128 inputs. With such a high channel count and number of fi­nal destinations, we needed a more cost effective solution than conventional distribution or copper splits. With 12 Cisco Giga Switches SG300 network systems, we were able to link all three Soundcra Vi series consoles and RedNet units through Dante. With Focusrite RedNet, we get a lot of warm tones without having to go to the expense of purchasing a lot of ‘analog’ plugins to help ­x the tone on the back end. Integrating RedNet into our existing workflow was very easy – each piece of gear is pretty much plug and play and we really only needed to get a Cisco switch to control the flow. RedNet comes with its own soware so we didn’t have to purchase additional soware over and above the cost of the gear which is a huge bene­t. Ease of use is phenomenal – I didn’t want our gear to be ‘engineer-only’ – I wanted the process to be usable by our volunteers as well. We get the great engineer sound we want, without having to have an engineer! We had three training sessions for my eleven volunteers, and they can control the audio, patch it, route it and do pretty much everything they need to without having to worry about the audio dropping out or sounding wonky. Our RedNet units each take up one space on our rack, so they’re very compact. They come with redundant power, so they’re pretty much fail-safe. Since Dante also sends out primary and secondary signal as well; if one power supply or primary signal flow happens to fail or goes out, the second kicks in without glitch or notice to our congregation. We had 128 inputs, returns and tie lines at all locations; a total of 384 lines at lengths of 120 to 250 feet each. We were able to replace them with two CAT6 cables per location (front of house, broadcast, and monitors). Previously, just for front of house, we had 128 125 foot analog lines, replacing those with just two CAT6 lines has been very eff­ective. We started our RedNet install last summer based on my design and I’ve been able to install it myself with the help of my volunteers and work out the bugs as I go; to see it come into play has been awesome. Our band and singers love it and our members love the sound quality as well. 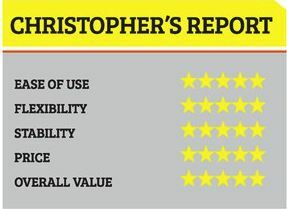 ‑e team at Focusrite also has phenomenal customer service, so I would rate their tech support as a major buying point for us. When we upgrade our current loudspeakers with our new Danley 96, 95, SM80 and Tap 18 this summer we will have our audio right where we want it. Once we marry up the RedNet with the Danley loudspeakers, our audio will be untouchable!